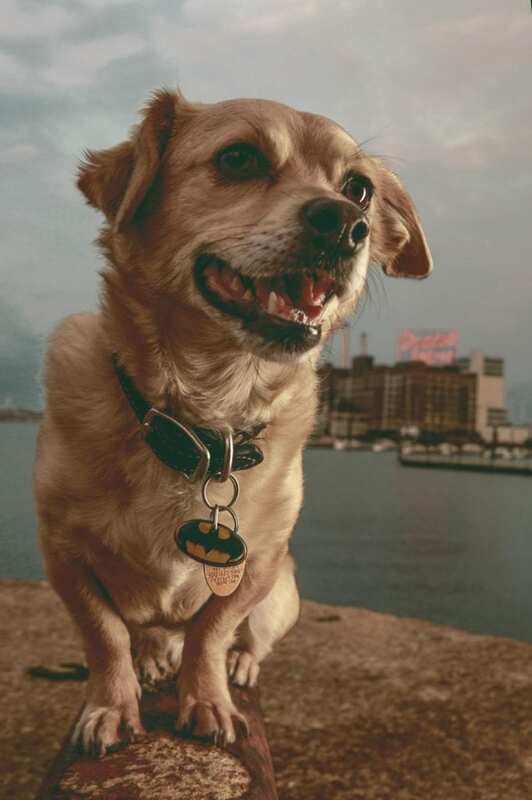 Photographing dog portraits on location and in front of landmarks in Baltimore can be difficult. It’s one of the main reasons why we maintain a dog friendly photo studio. 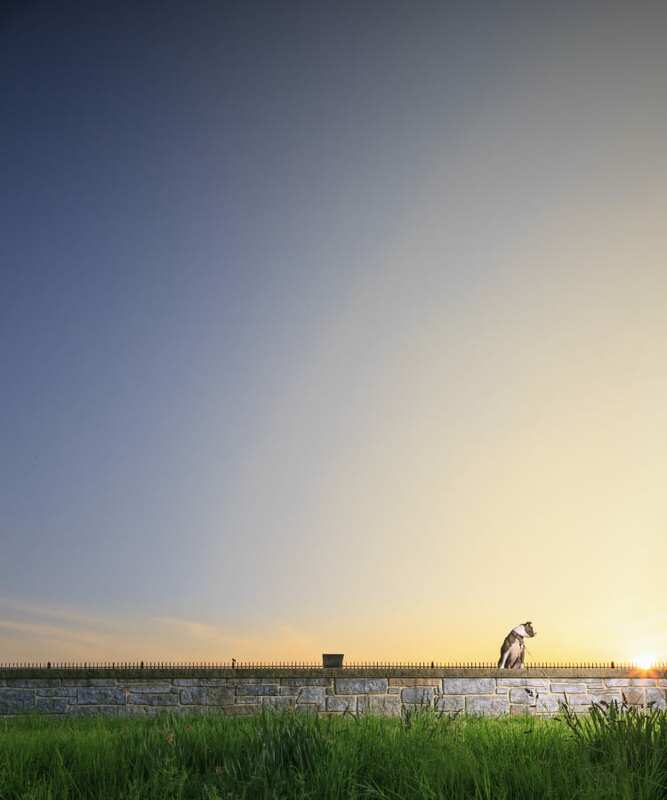 Half the battle is just finding the right location and angle to set up for your pup’s photoshoot. 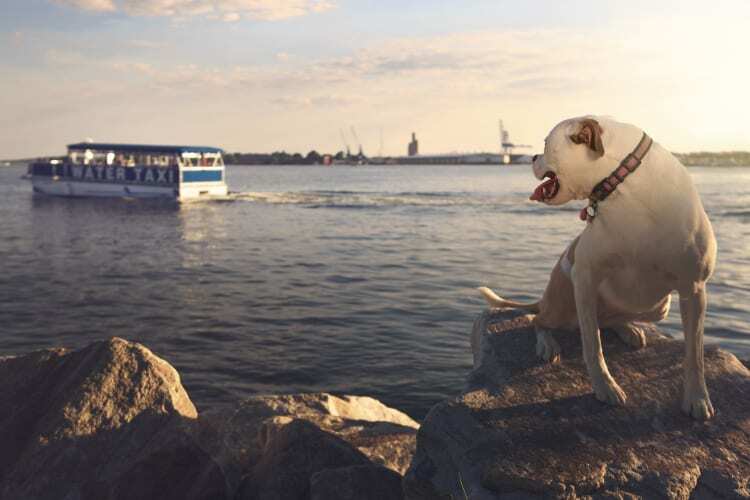 Baltimore (like most large cities) is filled with sights, sounds and smells that can be extremely distracting for even well trained dogs – including other furry friends, fast moving buses, cars, and large crowds of people. But with proper planning and a bit of luck, environmental portrait sessions can result in almost unreal imagery. 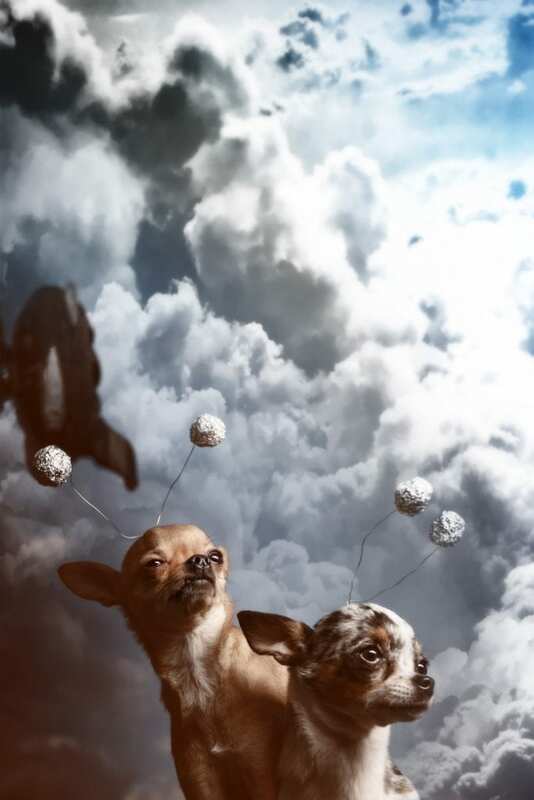 When staged lighting, meticulous compositions, unique dog costumes, and spontaneous poses meet the final shots can be down right magical. Capturing a landmark’s best angle often means we are forced to photograph a dog from a location that isn’t the best lit. To complicate matters even further, more iconic city landmarks are often towering or located at the center of busier tourist hubs. They may even be located along side busy streets or heavily trafficked roads. This is especially true in Baltimore, with some of the most memorable scenes are located around the Inner Harbor or busier neighborhoods, such as Fells Point, Canton,, Mount Vernon, Federal Hill, and Hampden. 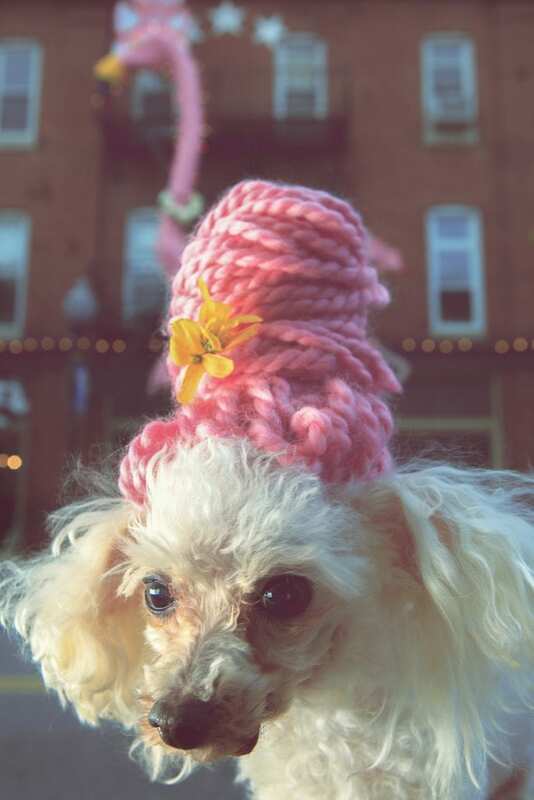 Just look at this portrait of a poodle in a classic pink beehive wig in front of the Hon Bar in Hampden. With proper timing and the correct angle, you’d never know that the Avenue in Hampden was a busy thoroughfare and a can’t miss hot spot for visitors to Baltimore. Mitigating scene clutter and distractions from our dog portrait compositions often requires us to photograph dogs at very specific angles. Forcing us to place dogs up on platform or modeling stools and to make images work even when other factors are less than optimal. 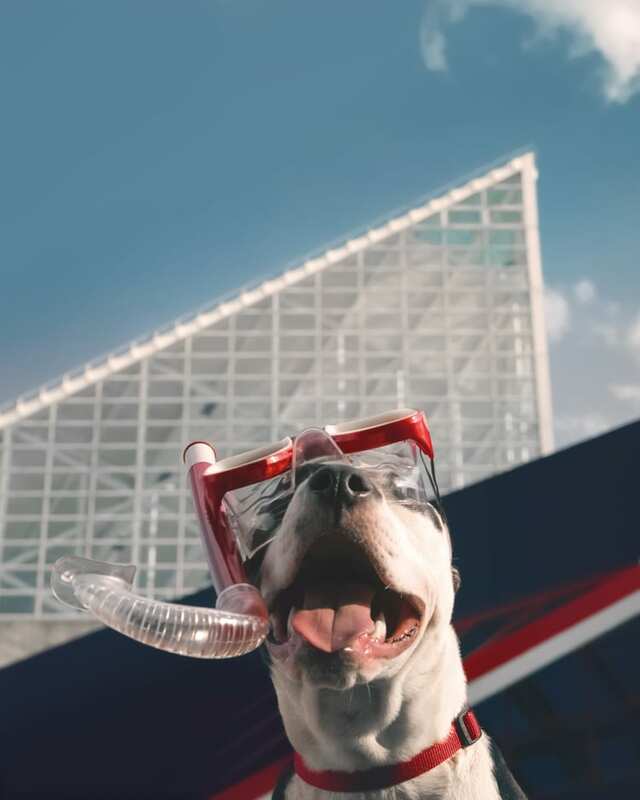 Such as this photo of a smiling pit bull wearing a snorkel and mask from behind the National Aquarium. An area that is both poorly lit and extremely busy with pedestrian tourist traction. 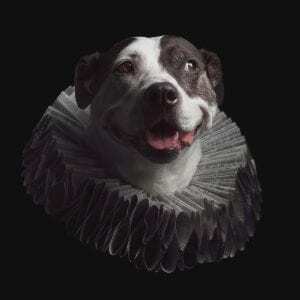 With the help of battery powered strobes and proper staging tools to help pose our canine subjects, we try whenever possible to bring the studio with us on location. This approach often requires a bit more effort on the part of our professional pet photographers and often demands that we schlep bulky pet photography equipment (light stands, modeling stools, large light umbrellas, soft boxes, and tripods) for blocks. 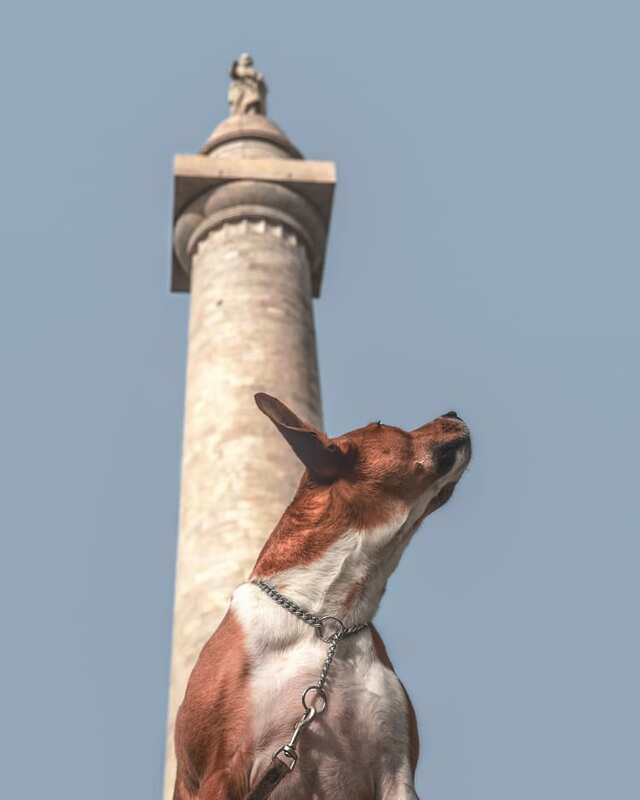 This dog portrait taken against the Washington Monument in Mount Vernon square is a perfect example of an amazing scene that is near impossible to park near during peak rush hours. While this equipment can certainly be a hassle, especially in areas with little to no accessible parking, it’s really the only way to consistently photograph dogs well on location. 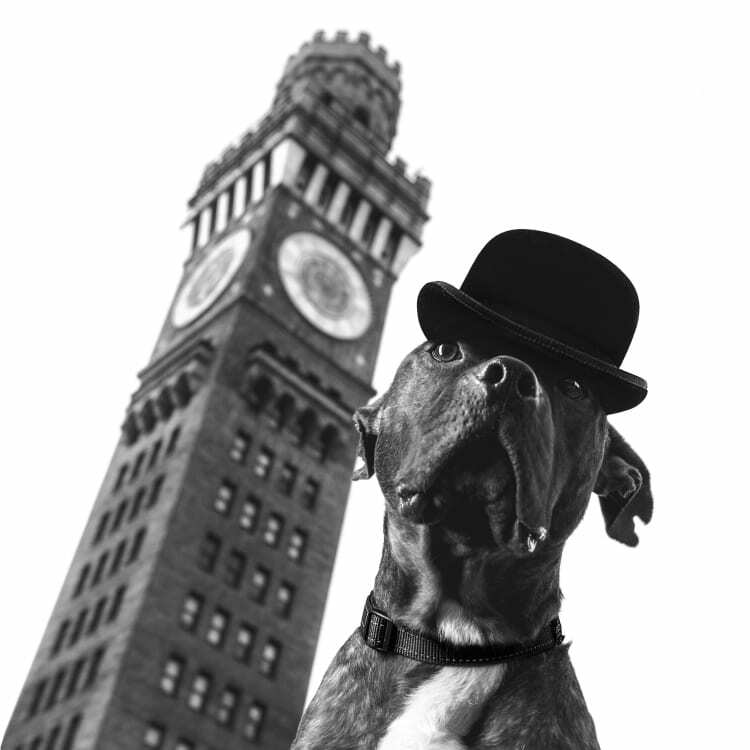 Without the help of a stable tripod and light stands it would have been impossible to capture this photo of Pollo the American Pit Bull in front of the Bromo Seltzer Tower near Campden Yards. Because fo the tall structures surrounding the property, there’s simply no other way to light this scene while still remaining in a position that would otherwise be in the shadow of the Convention Center, Baltimore Marriott Inner Harbor, or Baltimore Holiday Inn Inner Harbor downtown hotel. Maryland and Washington D.C. are notorious for their quickly changing weather patterns — especially in the spring and late summer when it can rain or become cloudy with little to no warning. As the best natural light is often within an hour of dawn and dusk (the Golden Hour), working on location demands that we work on a tight schedule. 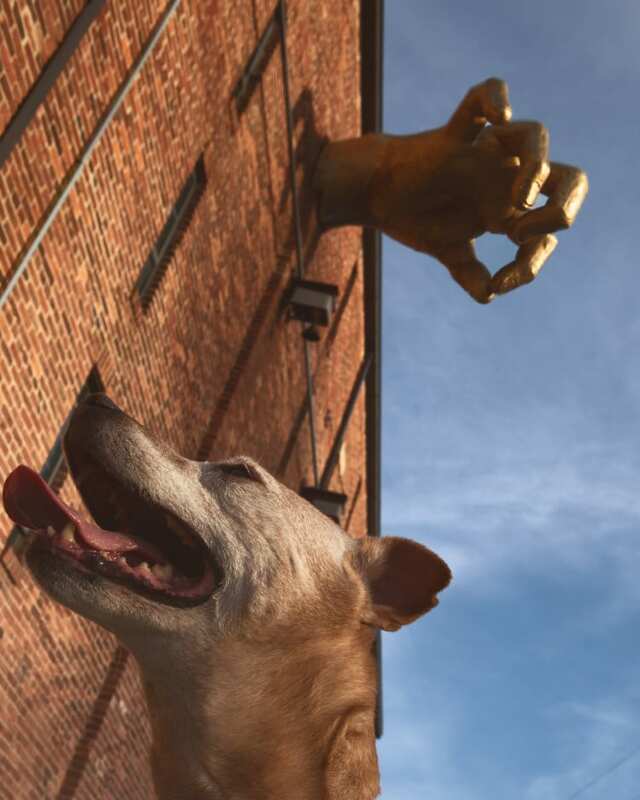 By working in the mid afternoon we were able to capture the sun shining directly against the knuckles of the Golden Hand at the American Visionary Arts Museum. But our window for this shot was extremely limited as within 30 minutes of us setting up, we were suddenly in the shadow of Federal Hill. While the photo would still have been great, it would have lacked the glowing details along the knuckles and finger nails of the giant hand. When working from a fixed location and in rapidly diminishing environmental conditions, we rarely have the time to wait for the weather to pass. Considering how rare it is for a dog to sit still in a busy location, it’s all that much more important to ensure that we are freezing the action to make the most of these colorfully vibrant, but dim twilight scenes. Not to mention, certain aspects of a scene may not occur again at all that day – if at all. Such as this classic shot of an older model Water Taxi cruising in the background of this environmental pet portrait taken at the Caton Waterfront Park. In fact this image was taken just days before this iconic Water Taxi design was replaced for good by the slicker black water taxis we see floating around the Inner Harbor today. There are a few reasons we haul studio style strobes and mono lights on location instead of using hot shoe mounted speed lights. These smaller flash devices are commonly used by professional photographers who work weddings, parties and other events. While these tools have their time and place (their light, easy to handle in a photographers off hand, and produce reliable fast light) they’re not a great fit for art portraits. 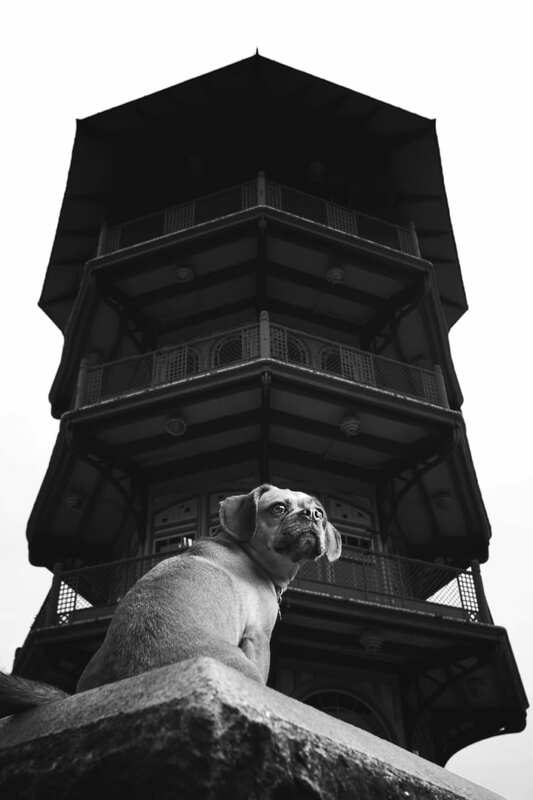 Producing a large soft almost ethereal light like as seen here in this whimsical puggle (pug + beagle mix) portrait taken in front of the Patterson Park Pagoda would be near impossible to replicate with a smaller speed light or with natural light alone. Light has physical attributes that constrain how it impacts subjects. Smaller and further artificial light sources are harsher than light sources that are closer and larger. These constraints can be bent to a certain degree by using larger soft boxes and by placing flash devices closer to the subject, often hiding the light source deeper within the scene. But when working in tight conditions where image quality is of the upmost importance, you often want to be using a full size mono light and umbrella. As any landscape photographer worth their salt will tell you, capturing vibrant twilight scenes with larger depths of field require longer exposures. While most crisp shots are photographed at 1/200 of a second, longer exposures can last 5 – 10 seconds (or longer). But by leaving the shutter window of a camera open for a longer duration, a photographer is able to allow more light into the frame without increasing the width of the opening or introducing noise to the frame, by increasing the sensitivity of the camera. 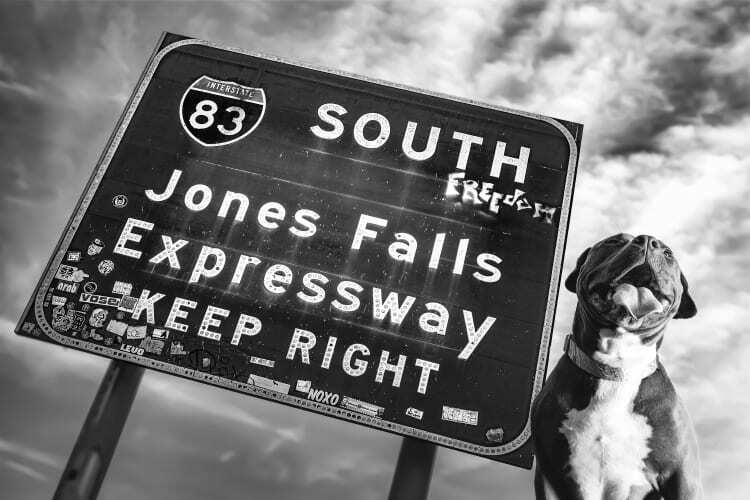 As seen in this colorful photo of a well behaved American Staffordshire Terrier sitting on the wall overlooking the Jones Falls Expressway at Druid Hill Park is a great example of the wonderful and vibrant colors that can be captured with the help of a long exposure. As you might imagine, 10 seconds is an impossible amount of time for a dog to sit still for a photo. That’s why longer exposures are typically reserved for landscape photography. But by using a high speed strobe that is desynced from the shutter speed photographers are able to blend the best of two worlds. Instantly freezing movement with the subject while still allowing sufficient time for a longer exposure to capture the vibrant hues of a dimly lit twilight scene. 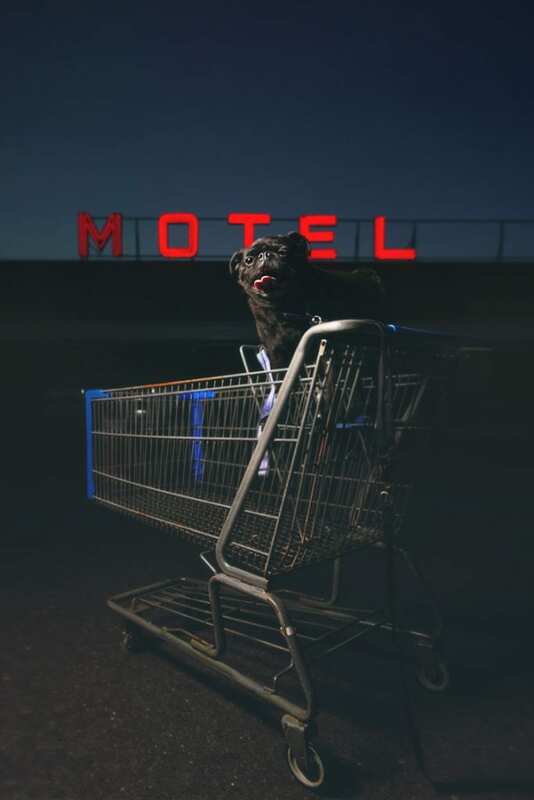 This photo of a black pug captured at the Beltway Motel in Arbutus utilized three light sources synched to two separate processes. The dog and shopping cart were primarily lit by the help of a stand mounted mono light and were effectively flash frozen at 1/150 of a second. The self illuminated Motel sign and soft gradient in the nautical twilight sky cast by a setting sun were dependent on an extended 15 second long shutter release. Of course, this is an extreme example. And , if you look closely you’ll notice that slight movements to the cart and dog have created an almost painted effect. Which is not necessarily a bad thing, but a compromise that one should be aware of when working in near dark conditions with more advanced exposure controls. This technique is impossible to capture with most on camera TTL flash devices. But is a simple task for even older strobes and mono lights to pull off with ease. 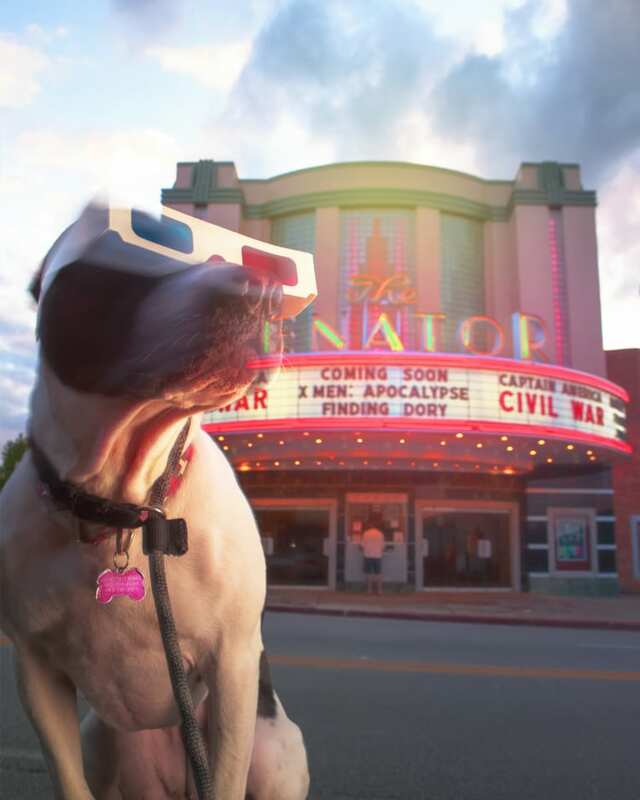 More skilled pet photographers can use this technique to introduce blue in more creative ways, such as seen here in this photo of a senior bully puppy from Bella’s Bully Buddies wearing old school red and white paper 3D glasses in front of the historic Senator Theater in Northern Baltimore on York Road. Environmental pet portraits and on location photoshoots should be considered a viable option for dog lovers looking for great puppy pics. But they should not be approached casually. As professional pet photographers we have tools and techniques at our disposal that can over come most hurdles we may encounter during an on location pet portrait session. But many of these approaches require prior scouting and planning to be executed without a hitch. Before planning an on location session – especially one that includes landmarks – before sure to contact the studio prior to booking your shoot. We are happy to walk through your shoot, answer any pet photographer questions you might have and generally do whatever we can to help meet your expectations make the most of your pet portrait investment.